If any DTC is output, perform troubleshooting procedures for that DTC. 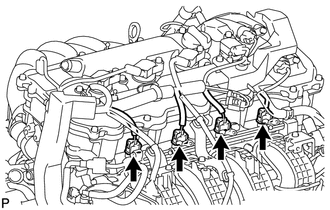 (b) Remove the ignition coils and spark plugs (See page ). (c) Disconnect the 4 injector connectors. (d) Install the spark plug into the ignition coil, and then connect the ignition coil connector. (e) Ground the spark plug. (f) Check that spark occurs at each spark plug while the engine is being cranked. Cranking will stop if the engine switch is pushed again for models with cranking holding function. If a spark plug has been struck or dropped, replace it. If an ignition coil assembly has been struck or dropped, replace it. If spark does not occur for any cylinder, perform the following Inspect Ignition Coil and Spark Test procedure. (g) Connect the 4 fuel injector connectors. (h) Install the spark plugs and ignition coils (See page ). (j) Clear the DTCs (See page ). Perform "Inspection After Repair" after replacing the spark plug and ignition coil assembly (See page ). (a) Check that the wire harness side connector of the ignition coil with igniter is securely connected. (b) Perform a spark test on each ignition coil. (1) Replace the ignition coil with a known good one. (2) Perform the spark test again. 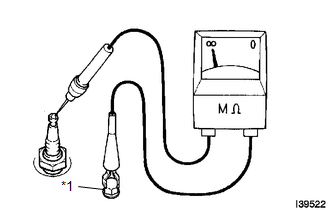 (c) Perform a spark test on each spark plug. (1) Replace the spark plug with a known good one. Inspect the ignition system (See page ). (1) Using a megohmmeter, measure the insulation resistance. If the result is not as specified, clean the spark plug with a spark plug cleaner and measure the resistance again. (1) Quickly accelerate the engine to 4000 rpm 5 times. (3) Visually check the spark plug. 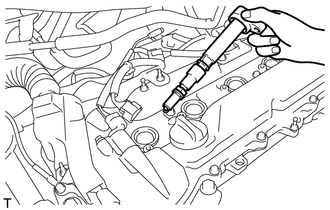 (4) Install the spark plug (See page ). 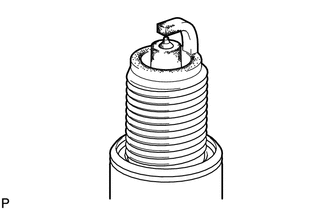 (c) Check the spark plug for any damage to its thread and insulator. If there is any damage, replace the spark plug. 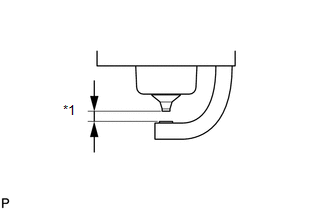 (1) Check the spark plug electrode gap. If the gap is more than the maximum, replace the spark plug. Never attempt to adjust the gap of a used plug. Only use a spark plug cleaner when the electrode is free of oil. 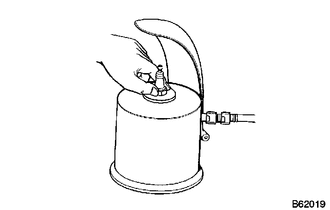 If the electrode has traces of oil, use gasoline to clean off the oil before using the spark plug cleaner.